Make your life easier with the E BLOCK and VERSABLOCK pipe support blocks by Freedom Inc. Based in Caldwell, Idaho; we ship throughout the entire Northwest. Designed especially for electricians, the E BLOCK is an efficient, versatile conduit support system and standoff solution. Its specially designed slots accept strut clamps from ½” EMT to 3” IPS. The strut can be added to individual E BLOCKS for larger conduits or bridged for multiple pipe runs. Like the VERSABLOCK pipe support blocks, its pyramid design allows nesting for ease of transportation and provides exceptional stability. The E BLOCK conduit support system is easy to install and it minimizes costs while maximizing profit margins. You can’t even cut wood for less money! Don’t waste time and money on a strut when you don’t need it. The unique slots in the E BLOCK pipe support systems are designed to accept strut clamps without the use of a strut. Strong, lightweight, and stable, the E BLOCK is the ultimate conduit standoff. Strut slots accommodate up to one 3” IPS or three smaller conduits. For multiple pipe runs, a single E BLOCK may be used with a length of strut. 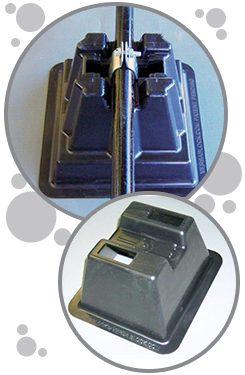 The E BLOCK is also fully compatible with the VERSA-SADDLE pipe support systems.